Negotiations form the heart of mergers and acquisitions efforts, for their conclusions contain both anticipated and unforeseen implications. Don DePamphilis presents a summary of negotiating and deal structuring that captures its dynamic process, showing readers how brokers, bankers, accountants, attorneys, tax experts, managers, investors, and others must work together and what happens when they don't. 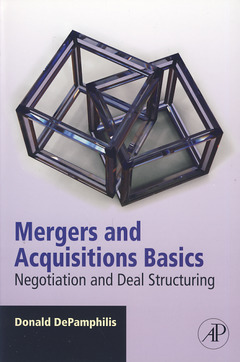 Writtten for those who seek a broadly-based view of M&A and understand their own roles in the process, this book treads a middle ground between highly technical and dumbed-down descriptions of complex events. It mixes theory with case studies so the text is current and useful. Unique and practical, this book can add hard-won insights to anybody's list of M&A titles..